Did you know that Santa was a Mac fanboy? You can't blame Santa Claus for wanting to keep up with the internet age, but when did a simple wish list turn into a £12 call? 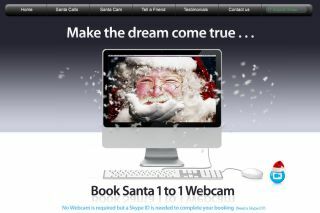 That's what Santa121.com is charging to for a face-to-face chat via webcam with the walking Coca-Cola ad. At least the cost of the call via Skype is free. You will of course have to book in advance to chat to Santa and you can forego the videocall for the phone-only version at £7.20. But how much of a Scrooge would you have to be to deny your kids that? On the positive side Santa121 is providing a free plug-in for Skype. This will enable you to keep forever that precious moment when little Johnny asked Santa for an iPhone and finally broke the back of your bank account. You can save the resulting video to DVD.